Fleetwood Mac News: Review: Stevie Nicks 'In Your Dreams' "Her voice and mystique are showcased in all their gypsy glory"
Review: Stevie Nicks 'In Your Dreams' "Her voice and mystique are showcased in all their gypsy glory"
She could have twirled off to golden-oldie land, resting comfortably on her Gold Dust laurels. She could have taken her forty years’ worth of credentials and retired to a castle in the hills, like her one-time Fleetwood Mac bandmate Christine McVie. But Stevie Nicks shows us with her seventh solo release, In Your Dreams, that she and her mysterious glamour aren’t leaving anytime soon, offering her finest collection of tunes since her breakthrough solo debut, Bella Donna, in 1981. Faithful followers of this melodic enchantress are well aware that two key ingredients of the Nicks appeal are singular lyric lines and scattered breathtaking moments, as much as entire songs. This principle is in full force here, from her sensual opening line in “Secret Love”, an invitation to “come on, it’s time to go upstairs,” all the way to the wistful coos in the two closing gems, “Italian Summer” and “Cheaper Than Free,” the latter a duet with the project’s main producer, Dave Stewart of Eurythmics fame. Always to his credit, Stewart artfully demonstrates a universal knack for bringing out the best in a female musical partner. A mid-tempo, mid-album block of three songs- “New Orleans,” “Moonlight (Vampire’s Dream)” (inspired by the Bella and Edward “Twilight” romance), and a newly-arranged take on Poe’s “Annabel Lee,”- sounds sufficiently pleasant, yet somewhat repetitive at first, given the fact that all are in the same musical key with similar rhythm and pacing. Eventually, the unique poetic nuances of each do emerge, aided by the ever-stellar harmony vocals of Stevie’s longtime ladies-in-waiting, Sharon Celani and Lori Nicks. The choice of a first single can make or break any album, and the pristine vanilla pop of “Secret Love” may not have been the best choice. Some critics would identify such choices as familiar tactical errors of past Stevie solo projects as well. It’s a nice enough, largely undemanding volley into today’s postmodern, musically-eclectic arena; designed as an effort to blend in with the perceived “hip and relevant” sonic palette and undoubtedly helped along by her recent pop culture star power moments on Dancing With The Stars, The Voice, the Fleetwood Mac episode of Glee, and even The Oprah Winfrey Show. 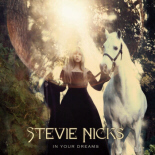 All in all, kudos are due to Stevie for this stand-out addition to her catalog. Praise must also go to Dave Stewart for his infusions of creativity and playfulness into these proceedings. He’s such a hero of this project that his picture is on the back cover, right next to the still ravishingly alluring Stevie who, along with Kirstie Alley, could be a spokesmodel for the slogan, “60 is the new 40.” Her voice and mystique are showcased in all their gypsy glory, wrapped up in her signature fierce, yet feminine, storytelling style. And every so often, for those who are listening most closely, there are vocal moments that truly recall the sheer brilliance of the chart-topping, globe-trotting Stevie days gone by. Simply put, she continues after all these years to ring like a bell through the night, and her international legion of fans still love to love her.